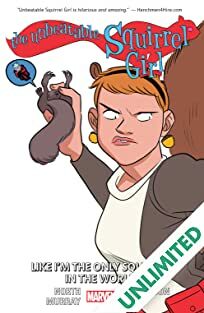 It's the 25th anniversary of Squirrel Girl! 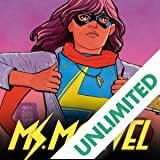 Twenty-five years ago THIS MONTH, she made her first appearance in MARVEL SUPER-HEROES vol. 2 #8, way back in January 1992! Then nothing really happened with her for like a decade, until 2005, when she appeared in – wait, what am I, Wikipedia? 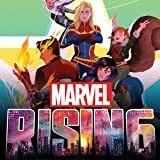 Wikipedia has all this stuff, and people don't read comic solicits for a HISTORY LESSON: they read them for some SWEET SPOILERS on what will be in their comics several months from now! So let's spoil some comics, huh?? SPOILERS BEGIN. 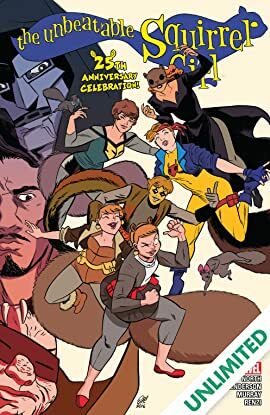 In celebration of 25 years of Squirrel Girl (SEVERAL of which actually featured the publication of comics starring her), we've brought back Squirrel Girl's co-creator, Will Murray, to write only his SECOND Squirrel Girl story ever! It's Squirrel Girl's 15th birthday, and she's gotten the greatest present of all: a run-in with THE INCREDIBLE HULK?? 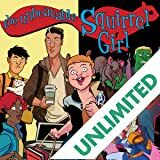 Also, your regular Squirrel Girl team is here to also tell a story, so that's cool too (Erica's drawing both)! 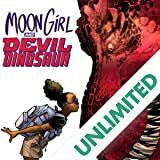 Two stories, two writers, one artist, and one quarter of a century with a character! It's a special one-shot you won't want to miss!! SPOILERS OVER. Now try to act surprised when you read it, okay? ?